Yakisoba is a kind of Japanese fried noodle. Yakisoba in Japanese means "fried buckwheat." It was first served in the early 1900s at Japanese food stalls and then later in the 1950s at mom-and-pop lunch counters to children as an afternoon snack. Since then it has become a popular dish at Japanese diners as well as food trucks. This is a recipe to make the most common type of yakisoba which is stir-fried with pork and vegetables. Packages of yakisoba kits are often available at Asian grocery stores and it is simple to make at home. You can adjust the seasonings and meat and vegetables to your taste, swapping out the pork for seafood if you like and including your favorite stir-fry vegetables. 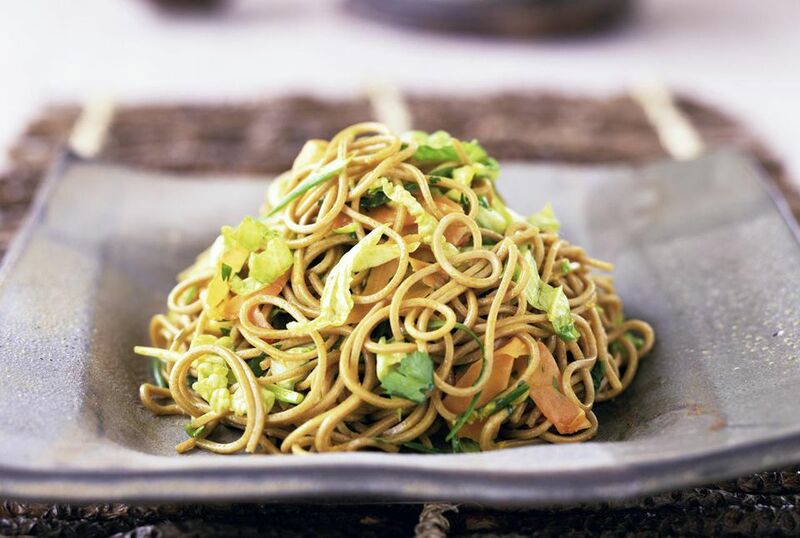 The yakisoba sauce has a similar taste and tanginess to Worcestershire sauce which is why it is offered as a substitute for yakisoba sauce in the ingredient list. Lightly loosen pre-steamed chuka noodles and set aside. Heat vegetable oil in a medium skillet over medium heat. Stir-fry the pork until almost cooked. Sprinkle with salt and pepper to season. Add carrots, onion slices, and green bell pepper to the skillet and stir-fry for a couple of minutes. Add cabbage to the skillet and stir-fry for another minute. Add noodles to skillet. Pour 1/4 cup of water over the noodles and cover the skillet. Turn down the heat to low and steam for a few minutes. Remove the lid and add yakisoba sauce or seasoning powder. (Adjust the amount of sauce to your taste.) Stir the noodles quickly. Divide yakisoba onto two plates. Sprinkle with aonori and beni-shoga just before serving, if using.